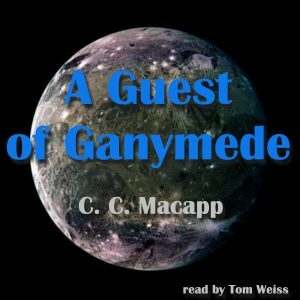 A Guest of Ganymede is a tale of a scoundrel and a blind passenger who have discovered alien beings that can reverse human afflictions. The blind passenger has chartered a spaceship to take him to Ganymede where he hopes to have his sight restored. The rogue plans to steal the secret for reversing the afflictions and make himself rich beyond his dreams. A macabre ending. C. C. MacApp, pseudonym of Caroll Mather Capps, was an American science fiction author who wrote several science fiction novellas. His novella, The Mercurymen, was a nominee for the 1965 Nebula award.